I like this card in that the receiver of the accolades is not shown high above the adoring crowd, but nearly at level with King Ludwig, a bigwig in his own right. The wands look like flowers in a vase, and the whole scene has an intimate look to it. I watched "Monty Python: Live at Aspen" on Sun., and the troupe had gathered all on one stage (if you count Graham Chapman's "ashes") for the first time in 18 years in order to receive an award. Such is the 3+3 nature of entertainer to fan- fans want to express their appreciation, and entertainers want to be reassured that their work is valued. The nature of the Six victory seems to be one not just of being good at something, but at winning the attention, hearts and praise of others with one's talent by bringing it to the community and enriching them with it. (Much like Graham gifting us with this deck). Graham's booklet says: "Fingerpin the ringmaster has appeared. 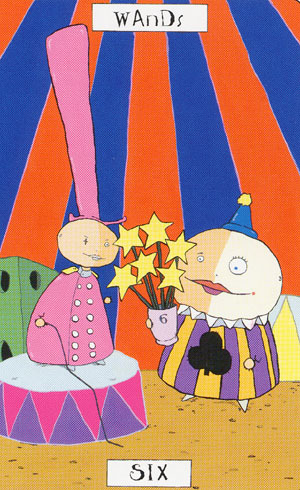 Another successful show in the Fire Wand Circus has ended, and Ludwig the King arrives to award Fingerpin with a trophy, congratulating him on another outstanding performance. Divinitory Meaning: The Six of Wands represents recognition, accomplishment, and impressive achievements. On the 6 of Wands, Fingerpin stands on a small platform. He looks proud and a bit mischievous, and holds a whip in his right hand – he didn’t get here by being sugary-sweet! To get as far as Fingerpin, you have to be assertive and determined, and you can’t be afraid to put your foot down! Fingerpin has a very high hat on, maybe to show that he has very high ambitions? Graham writes that Fingerpin is the ringmaster, the supervisor in charge of the performances in the circus, so he must have a bunch of responsibilities! The whole show depends on Fingerpin, and everyone is counting on him to bring it to a good end (what a stressful job!). The show has ended now and luckily, it was a big success. I think Ludwig symbolises that part of ourselves that drives us on to reach the top, that what makes us prove our independence and makes us show just what we are made of! Fingerpin must have listened very well to Ludwig’s advice: Ludwig even awards Fingerpin with a bouquet of wands, a trophy for all his hard work! What an honour! This really is Fingerpin’s moment in the spotlight – I imagine the audience watching the scene out of our view, cheering and applauding. The stripes on the circus tent look like rays of light and seem to stress this glorious moment. In the corner stands something that we can only guess is a giant dice to show the workings of fate. Fate has brought Fingerpin to this wonderful event! PS: Where the heck is everyone?! It's way to quiet here!